Both Barack Obama and Hillary Clinton have said really foolish things, but Donald Trump may have set a new record for economic illiteracy with this tweet. This tweet contains an astounding collection of inaccurate and offensive statements. I’ll briefly elaborate, starting at the top left and going clockwise. It is true that the United States used to rely on Hamilton-style tariffs, but trade taxes didn’t cause growth in the 1800s. Our prosperity was more a result of no income tax, no welfare state, and no intrusive regulatory/administrative state. Trade builds wealth and enhances prosperity, and that’s true whether the people trading live next door, across town, in different states, or in different nations. Protectionism is a form of cronyism. Politicians gain power because they have power to pick winners and losers. 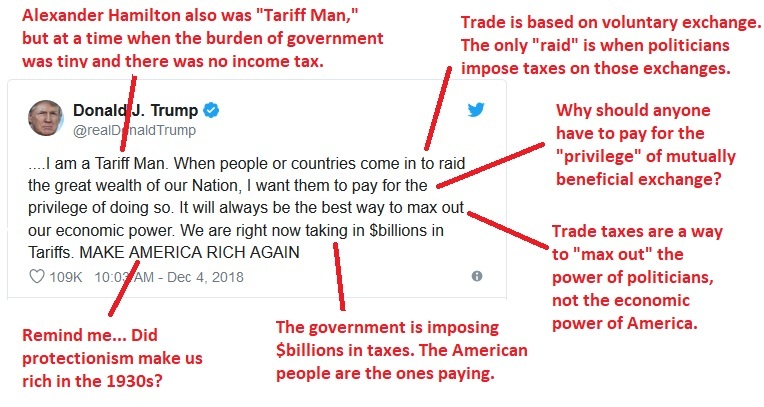 Tariffs are taxes. The money that is being collected is coming out of the pockets of Americans. The last time the United States made a big push for protectionism was in the 1930s. At the risk of understatement, that was not an era of prosperity. The bottom line is that Trump is playing with fire. Indeed, what’s happening in financial markets is a very worrisome sign that he’s putting the economy at risk. To be sure, I don’t think all of the volatility on Wall Street can be blamed on Trump’s protectionist policies and statement (the Federal Reserve should be blamed for creating a fragile market with easy-money policies). But a trade war could be the trigger that leads to the next recession. Trump is also the sanctions man. The Huawei arrest is an act of trade war. Mr Serafin should be aware that tariffs are simply a sales tax on the importing country’s citizens. Their effects are like any other tax, and so seldom beneficial. Their unintended consequences may be the crap shoot, such that e.g., corporate officers of tech. companies would be well advised to avoid visiting China for fear of reciprocal arbitrary arrest. I find Daniel Mitchell the single most inane source of absurd commentary on the net. And that is a really high standard. Tariffs have any of several particular purposes which serve to punish trade breaches by other nations or reinforce industries of the home nation. While some prices will rise in the short term, the long term benefits can be great. US tariffs blocking British imports in the 19th Century led to the growth of American industry which came to dominate the world. Other Countries who imposed tariffs on the USA was the infamous Canadian Diary tariff of several hundred percent. I believe most other Countries have some sort of tariff imposed on US products. But Americans expect to pay low prices as if it were some kind of birthright. What other countries impose tariffs on the USA ? Why should China obey U.S. intellectual property laws? Congress has gone way too far in protection to the point where invention is stiffeld rather than encouraged. It was a big mistake to protect computer software under Copyright. Ideas should be shared. What I find interesting in many of these economic discussions on Trump’s policies, is that it seems that nobody really has a clue of what really will happen pro or con. Other than historical context that might shed light on the current situation, there is a lot of hedging and uncertainity. So much of our economic policy by “experts” is just trading in theories that haven’t really been proven either way. The one constant that seems to torpedo any policy is that which nobody can control. Go ahead and punch holes in my theory and all it proves is that except for a few exceptions to the rules, it’s all a crapshoot.